In War in the Modern World, 1990-2014, Jeremy Black looks at the most modern of conflicts from the perspective that war is a central feature of the modern world. Arguing that understanding non-Western developments is crucial if the potential of Western war-making is to be assessed accurately, the book also asserts that knowing the history of conflict can only help future generations. Black argues for the need to emphasise the variety of military circumstances, as well as the extent to which the understanding of force and the definitions of victory and defeat are guided by cultural assumptions. War has a multi-faceted impact in the modern world, and this book shows its significance. As the latest volume in the Warfare and History series, this title takes a global and historical perspective on modern warfare, enabling the reader to approach familiar conflicts through a new analytical framework. 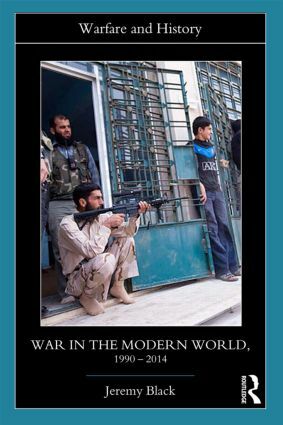 This book is an invaluable resource for all students of the history of modern warfare. Preface 1. Bringing Together Two Narratives 2. The Revolution in Military Affairs 3. A Conventional Account, 1990-2000 4. Signs of Difference, 1990-2000 5. The War on Terror 6. A Multitude of Conflicts 7. Into the Future. The Rivalry of Major Powers? 8. Into the Future. Weak States and 'Small Wars'? 9. Conclusions. Selected Further Reading. Jeremy Black is Professor of History at the University of Exeter. He is a leading military historian whose books include War and Technology (2013), War and the Cultural Turn (2011), A History of Diplomacy (2010), European Warfare in Global Context, 1660-1815 (2007) and Rethinking Military History (2004), and is editor of the Routledge Warfare and History series.